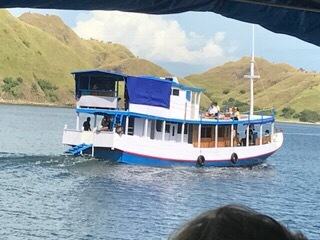 We arrived at our anchor spot in beautiful Komodo by 11 AM and we had booked a tour through cruise critic colleagues Erin and Mui. A lot of work goes into planning these tours, and there were 33 people on this one. It took a while for the authorities to clear the ship so that we could disembark on the tenders, but Erin was first in line to get all of our tender tickets, assuring that we would be on the first tender to the island. The sail in to the area was beautiful with mountains covered with greenery. Indonesia is composed of about 6000 populated islands of the total 18,000 in the world’s largest archipelago, with more than 300 ethnic groups calling Indonesia their home. 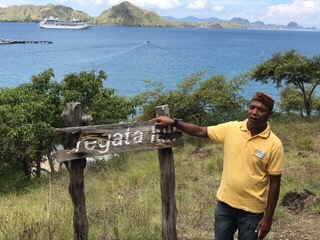 We have many Indonesian crew on board and as Leslie, our cruise director always says when we arrive in a new country, welcome to the guests and to the crew who live here, “welcome home”. 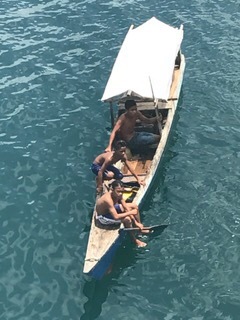 As we were waiting for the ship to be cleared, we were out on deck 5 and there were many children in small boats coming up near the ship and shouting “money”. Some passengers threw dollar bills down and the children would dive for them. In spite of being repeatedly warned by Leslie not to do so because of the danger of being so close to an anchored ship which does move, people did it anyway. 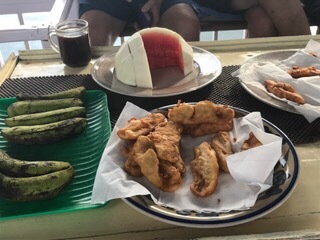 Once on the island, the guides also asked us please to not give money to the children as it encourages the behavior that the native people are not proud of. I would rather buy something from them. 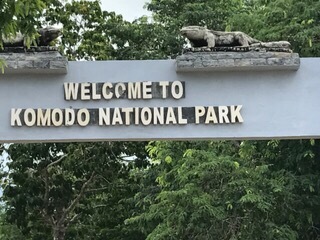 They do not allow any visitors to Komodo Island who are not on sanctioned tours. You must show tickets or vouchers when you arrive. 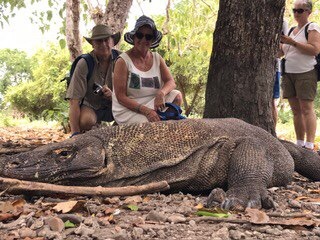 The main focal point of the islands is the world famous Komodo Dragon, or ora as it is known locally, which lives nowhere else but the Komodo National Park which combines Komodo with its smaller neighbors Rinca and Padar. 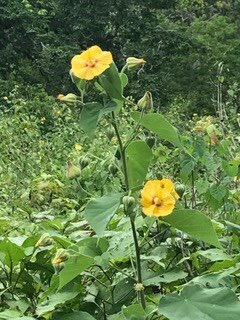 The park was established by the Indonesian Government in 1980 in order to protect its prime inhabitant but now expanded its protection to all of the plants and animals. The entire park including the three main islands and the surrounding waters covers nearly 1000 square miles. 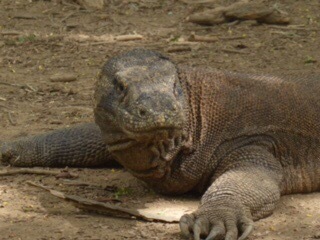 There are approximately 5000 dragons among all of the islands, the largest number, 2800, on Komodo. 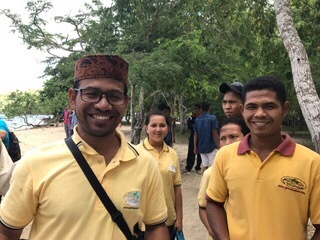 We were greeted by our guide, Hendrik, and a naturalist, Tafir, who took us on a 3 mile trek through the forest. We were able to see 10 dragons during our time there. 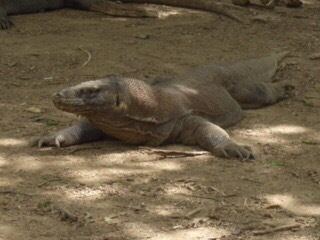 Male dragons can grow up to 10 feet long and weigh over 200 pounds, females are slightly smaller. They live from between 20 and 40 years in the wild. They have an amazing sense of smell and can detect their next meal from up to 5 miles away! We were warned not to go if we had any bleeding wounds and women having their periods are not allowed to go on the island. And, you cannot wear anything red as it is like showing red capes to the bull in a bullfight. Jan, our neighbor on the ship was going to wear gloves to cover her red nail polish! The dragons are extremely strong, with huge hooked claws and a forked tongue that they use in much the same manner as a snake. Their saliva is full of bacteria that will kill a human or any of their prey in a very short time. They are fast on land and can swim and climb trees. 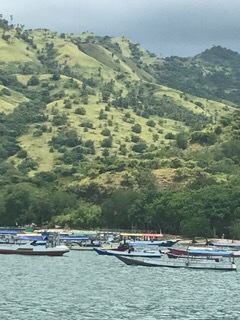 They eat the wild pigs and Timor deer that are found on the island. They are very territorial and will even eat each other if they cross into another’s territory. The guides have these long forked sticks that they carry. We sure hoped that would hold any hungry dragons at bay, but they really didn’t seem that interested in us. The females lay eggs which have a gestation of about 8-9 months, the longer the gestation, the offspring will be a male. The females guard the eggs for about 3 months, but don’t protect the offspring and will often eat her own babies. So the babies climb trees and stay there for about 2-3 years. Apparently it is too much trouble to climb up to eat them. 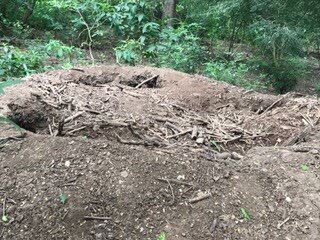 Here are some pictures of the dragons and also one of the nest in which they lay eggs. They have a lot of decoy holes to try to fool predators who want to eat the eggs, primarily the birds. 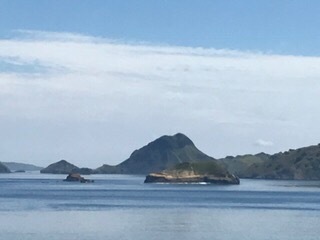 After our hike and dragon viewing, Norm opted to go back to the ship and I continued for the rest of the afternoon on the snorkeling trip. The group went on the wooden boats that the guides use to travel between the islands. Hendrik and his group traveled by boat for 4 hours to conduct our tour. I did take my gopro and got some nice video of the fish and the beautiful coral but cannot upload it on the ship with the slow wifi. I will have to do a whole video when I am in a hotel or back at home when it will work. I even got some footage of one of the dragons moving and flicking its long forked tongue. Trust me on that one! The coral was the most beautiful I have seen on this trip and second to the Great Barrier reef which I saw 8 years ago. Sadly, that one has suffered but this is varied and beautiful. 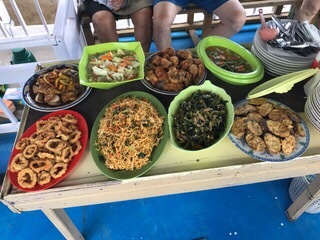 We were also served a wonderful lunch of native Indonesian specialties and I had to tell the guide that I am the type that takes pictures of my food! It was a wonderful day. When the ship was leaving, we had a torrential downpour, so no sunset pictures today. Tonight we were entertained by the fantastic pianist Van-Anh Nguyen. We heard her on our last world cruise and it was great to hear her perform again. Was that a live Dragon the people were kneeling by? WTH? The people are us!! Yes, it was a real one. The naturalist positioned us and took the photo. We hoped he knew what he was doing!